Since I got access to a couple of Estimote UWB beacons, I was craving to find out what makes it tick. Let me take you on the journey of absolutely destroying one of them indefinite. 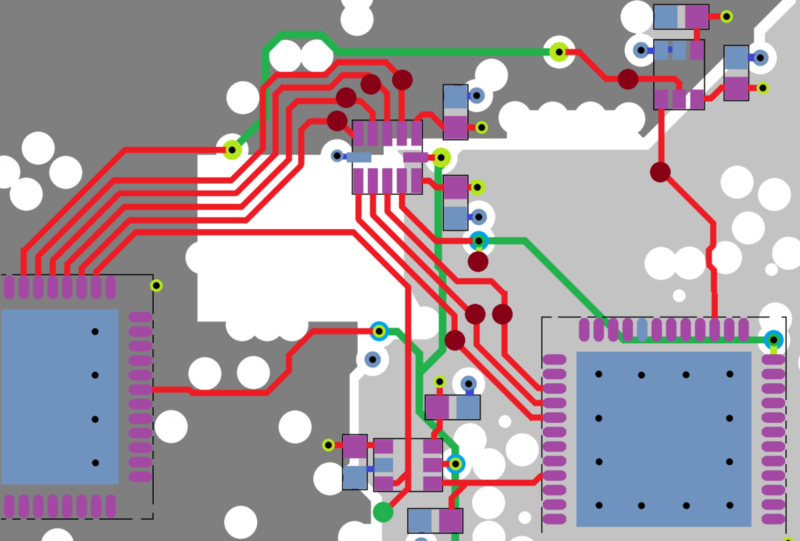 February 2018 was the month I finally cracked all the details of all major components on the PCB 🙂 I will give an overview of all components I have identified and where these components connect to both controllers. Not all components might be an exact match, but I will figure that out later. If you are also interested, you can buy the devkit here. You will get 4 UWB beacons to play with. Normally before doing a reverse engineering effort, I look at the FCC pages for more information on the device. It seems that the UWB device does not have any FCC certification (could not find it on their site nor on the packaging of the device). So I went ahead with desoldering every component and labeling them from 1 to 130. This number is corresponding to the container where I put the component in. The last component to be desoldered with hot air was the DW1000 which I did not have a container for so I tossed it together with the nRF chip. This explains the number 98-2. In time I will remove all the numbers because I have given them a significant name (i.e. U1, X1, R1, C1). I will spread the BOM in tables throughout the whole article not to make it a bulky thingy. When the process continued I was able to detect which passive components were belonging to which IC’s so I gave them a color coding on the above image. After looking up the datasheet of each active component I could see a 1:1 correlation between all the reference schematics and the Estimote UWB. Mind that this article is still in progress. The major chapters are defined and in the coming weeks I will add the content of all chapters. Now getting back to destroying the PCB. 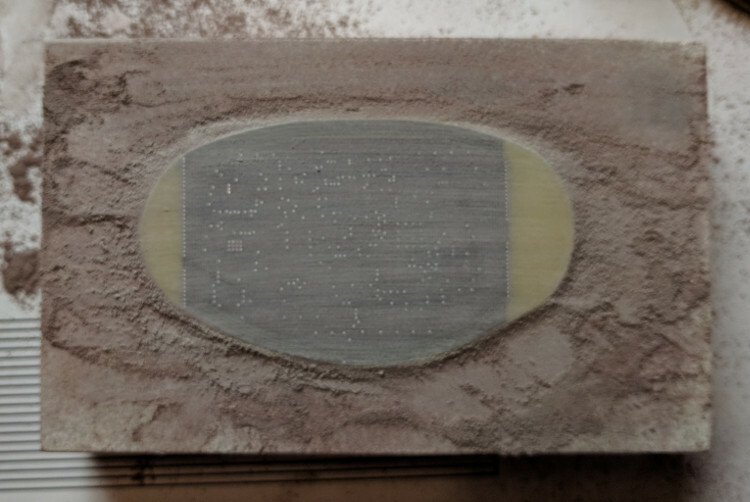 After cleaning up the PCB I used a sanding paper to get rid of the copper and epoxy bit by bit. The first part I did mechanically, but the last touches were done manually to prevent sanding away too much copper. I got help from the community in solving unknown components. All three unknown components were correctly identified. Thanks Ivan and Johan for the help! On the site of Estimote there were the specs of the UWB device. It gives hints on which components I am looking for in the journey to crack this pearl. nRF52832 Bluetooth® SoC ARM® Cortex®-M4 32-bit processor with Bluetooth Low Energy (BLE). The specs say it supports Bluetooth® 4.2 LE standard. But the spec of the nRF chip says it supports Bluetooth® 5. Of course, something to look in to. There is a smart front end which has 2 antennae. One PCB antenna and one connector for an external antenna. The end goal is to connect all the BLE devices together in a mesh network. A room should be fitted with a couple of UWB Anchors which are stationary beacons. The other beacons in the room should determine the position and share that position with the mesh network. One of the anchors is connected to a gateway which shares all locations of all tags with a WiFi network. Then you can connect any phone to the WiFi network and keep track of the UWB tags in the building. (68) 0.8pF RF correction network? (69) 3.9nH RF correction network? 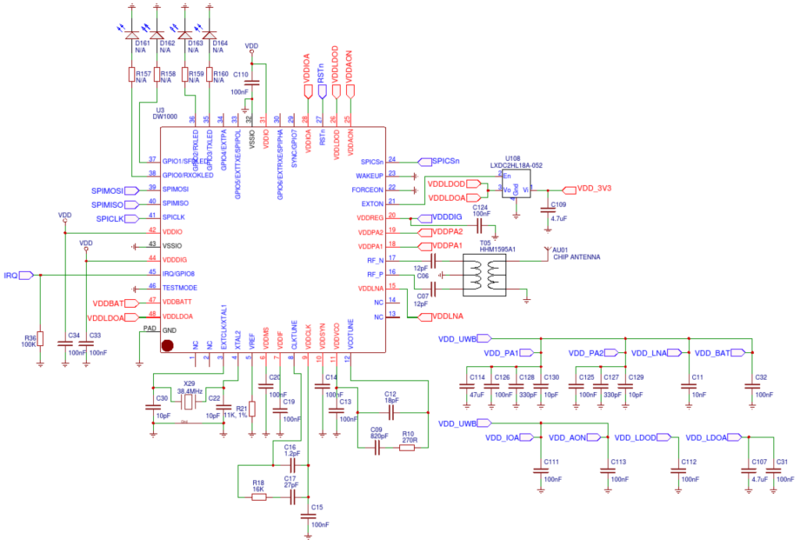 TODO: Add NFC antenna to the schematic. And this is the part where I am interested in. With this technology you can measure the Time of Flight (TOF) which says something about distance. Using triangulation will tell you also the absolute position especially indoors. TBD. There are three IC’s which I could not identify (yet), but it does not have my immediate attention. For making new firmware I need the major components and their connected sensors. The power supply/enable switch mechanism is stright forward. On the board is a connector which can be used for GPIO. On this connector you can run the robotics indoor example as described on the Estimote website. It looks to be open source at first glance, but it seems to have compiled libraries. Of course, I will have a look at how to hack into that later. The connector is reachable even without taking the PCB out of its casing. On the silicone casing there is a marking where the 4 pins should be inserted. There is also another place where you can do GPIO and that he at the pads where the pogo pins can be hooked up to. These can be used to do firmware upgrades and it can probably be used to power the unit. TODO: Add the resistors, diodes and detection logic. The second part of the GPIO is wired to the DW1000 chip. 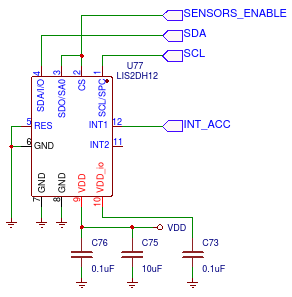 On the PCB there is room for 2 components in series per IO. 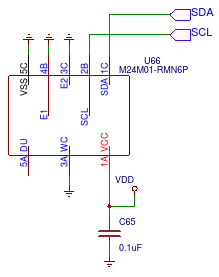 This could mean a resistor + a LED per output? Let me first find out the specs of the DW1000 to see how much it can sink/drain. The interconnects between the and nRF52832 the DW1000 is done through a Voltage-level Translator (TXB0104 4-Bit Bidirectional Voltage-level Translator With Automatic Direction Sensing). Two extra signals are steered by separate 1-Bit Bidirectional Level-Shifting, Voltage-Level Translators (TXS0101 1-Bit Bidirectional Level-Shifting, Voltage-Level Translator With Auto-DirectionSensing for Open-Drain and Push-Pull Applications). If you look closely you will see that all three level shifters get their power supplies from 2 different gray power planes. I guess that the DW1000 is consuming loads of energy and I also think that the complete power rail of that section of the board is switched on/off depending on the need for that function. I am not sure if the level of both power rails (nRf and DW1000) have different voltage levels. I will be doing some measurements with a scope and logic analyzer later. The list of sensors was guiding me in which components (or equivalent components) could be on the PCB. 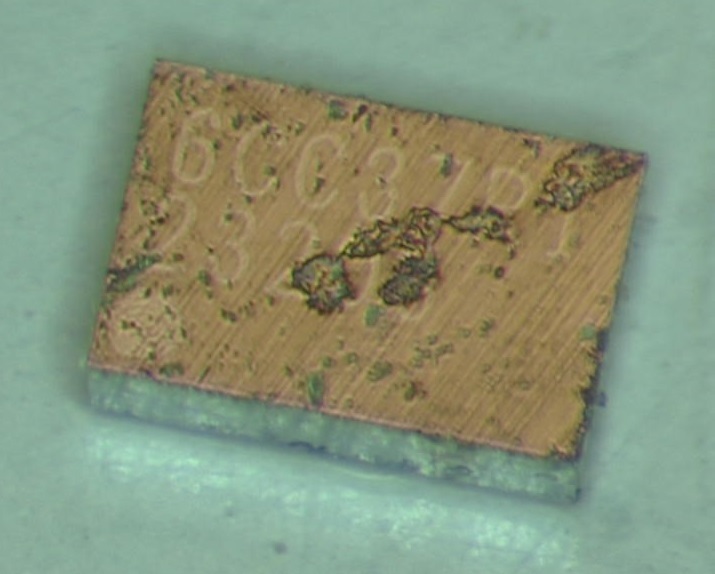 Just combine the exact text with the SMD markings and you find the component on Google, DuckDuckGo, Bing or whatever other search engines. I wish it was that easy, but in the end, I think I found out enough to work with. This one, especially this one was hard to find. I was sure it had a I2C interface looking at the pins. 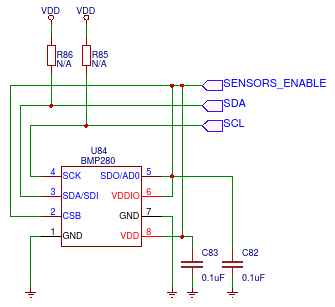 SCL and SDA were connected to other identified I2C components so this one had to be one too. I kept on coming back to the well used MPL115A1(SPI) MPL115A2(I2C) but these were not pin compatible. Finally I found out, via Google image search, that the pins match with the Bosch BMP280. (02) (TBD) Decoupling capacitor for ambient light sensor??? Is this for an analog reference or just to measure the battery level. I think it is the last one . ..
(39) ??? Voltage divider for analog reference? (40) ??? Voltage divider for analog reference? You might think, why buy 12 of them? 1) because I can, 2) I want to do research on indoor navigation, 3) because I can, 4) The alternative prozyx.io did not fit in my innovation budget and an email to one of the founders did not deliver a reply, 5) The device is a nice platform with a nice MCU, peripherals, power supply. So I can re-purpose the device to to other things with it. Why UWB technology? 1) because I can, 2) It works, at lease that is what sales told me (LOL), 3) you do not need a visible Line of Sight (LOS) from the Device to the Anchors, it should work with the device in your inner pocket. What are the alternatives (with great accuracy)? 1) Philips Visible Light Communication, 2) could not find any other really working alternatives. What else? Wikipedia has a page on Indoor positioning. Al the alternatives there were not to my use or I did not find them to be fun to investigate. Maybe that will change when I cracked the UWB technology. Why not choose Philips Visible Light Communication? As an employee of Altran, I can probably get my hand on information from co-workers. They have worked with that technology already. But I don’t want to do that. All my work on this site is in the open-source domain. I also don’t see any open-source libraries which make use of that technology (yet). Maybe I need to look harder. In time I do want to make a comparison between UWB TimeOfFlight and VisibleLightCommunication (VLC). Subscribe to this site and you will get a message as soon as I did that. The advantage of VLC is that the camera needed for that is on everybody’s phone already and the technology for UWB is not in so you need a separate device. This one is not a mystery anymore. Johan, told me (in the comments) that it is a CSD23203W –8-V P-Channel NexFET™ Power MOSFET. I first suspected that it is a reverse polarity protection device. It does not affect the voltage significantly. This one is not a mystery anymore. Again Johan, told me (in the comments) that it is a 6.5 mΩ, Bi-Directional Battery Switch in Compact WCSP. This is indeed a switch. 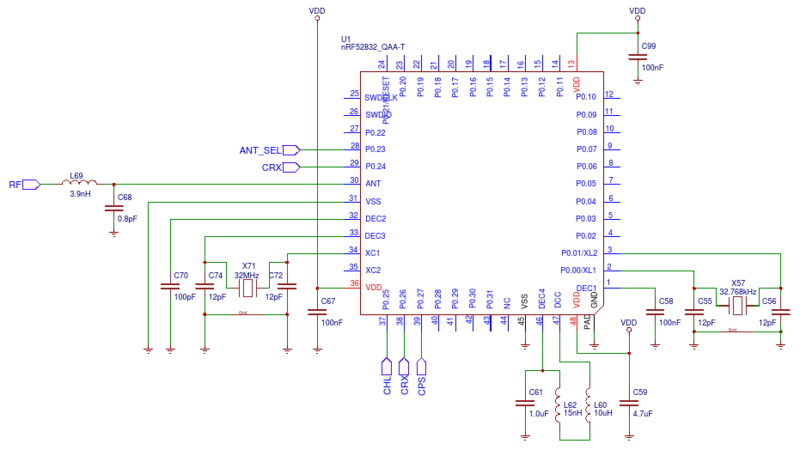 There is one pin which comes from the GPIO-Power pin. When power is provided to the GPIO connector, the supply from the battery is cut off. It does not affect the voltage significantly. The component is covered with a black resin of some sort. Heating it with an iron gives fumes which really burn in your eyes. After experiencing that I mechanically removed it with a blade. That explains the scratch marks on the component. This one is not a mystery anymore. 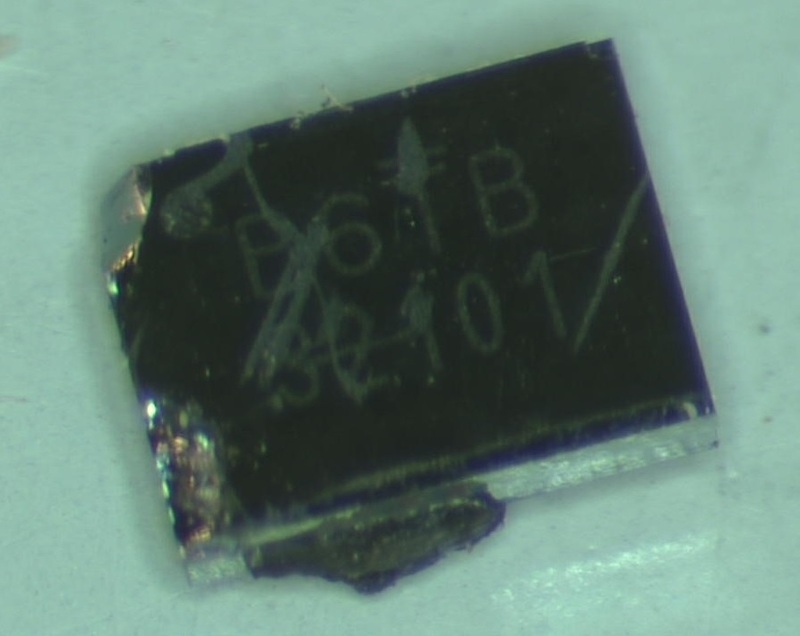 My co-worker, Ivan Waterman, told me that it is a PTC RESETTABLE FUSES 1.0A 6V 1206. I did not think of a fuse. In the schematic, they are in series with the batteries. My first guess was that it is a diode but the multimeter says it surely wasn’t. A lot more can be done to find out its inner workings. Stay tuned and subscribe to this site to receive a notification when the article is changed. Mystery component 23, 48, 64, can it be a self reseting fuse? Thanks Ivan! I have adjusted the article that it is not a mystery component anymore. Have a great weekend! Thanks again Johan! But how did you find it, which google terms did you use, what was the search strategy? I did a parametric search on Mouser and this one did not pop up on the list . .. Awesome Johan, thanks! But how did you find it, which google terms did you use, what was the search strategy?. I know why I couldn’t find it. On Mouser.com and everywhere else I was looking for a WLCSP package. On Mouser parametric search it is listed as a DSBGA-6 package. In the future I want to make a page explaining all the package names available with their pinout. I would surely have found it when I knew the WLSCP also had another description. The less you specify the more you find… When a full part number complete with details fails to return anything; omit family or variants (xyz123ab -> 123ab -> xyz123 -> 123). But I suspect you tried all that. Make sure you look for the datasheet. Adding package naming like WLSCP is too specific. I think in above cases ‘123 datasheet’ worked. Using the website of component suppliers like DigiKey or Mouser might work, but I think Google has indexed those too. And do not forget to try another search machines, like Bing/DuckDuckGo, too. I bet they get the temperature from one of the Chips on the board. The BMP280 and the LIS2DH12 both have an internal temperature-sensor and i would bet the micro does as well. I’ve recently been considering making something like this for my own purposes, I still would want a more convenient object to have on my person, but these look great. If you’re working on open source firmware I may well piggyback on your work with what I do. Then it’s lovely lovely integration all the way! Thanks Shannon, I look forward working together. Mind however that in UWB mode the device drains the battery power of these devices fast (drained within 8-9 hours). For the anchors (stationary beacons), you can feed them via the GPIO port with a power outlet connected 3 volt regulator. I still need to look at the specs of all separate components what the minimum and maximum voltages are. For the moving part you are carrying on yourselves you could do some extra stuff to save energy. I was thinking of using the interrupt output of the accelerometer and only power the UWB part when you are on the move. This should significantly reduce power. The build quality of the Estimote is great and the hardware design is quite promising. The UWB part is switchable and they really did a nice job to conserve battery power. 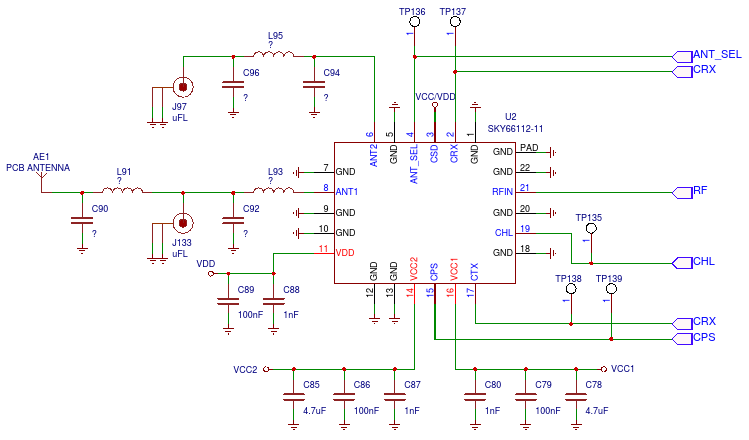 When combining the board, ripping off the battery part and joining a LI-ION battery to it would make it a quite nice platform to do navigation with. This is really impressive! I am really curious how does their “automapping” feature works in general? What do you think? i’d like to know this as well! do the beacons need external wifi to automesh? No, you do not need WiFi for the AutoMap except for maybe the map to be uploaded to the cloud. In fact, I should say, I do not know. Their automap feature. It looks nice. Here is my experience. For the app I had to buy a iPhone 5S. I normally would have never done that. I am an Android geek and I am probably not going to migrate to the iThingies. The app crashed a lot like 10 times in a row. The 11th time I could get an automap of a room 5×5 meters where the anchors were placed in a rectangular configuration at the same height. The UWB mode really uses a lot of power. The batteries were drained with 20% in half an hour trying to do Automap again and again, crash after crash. I did not report the crash to Estimote yet. So maybe they do not know yet. I want to fix the battery drain by providing external power. Also I want to fix the app crashes by making my own (on Android probably). Automesh only accepts 4 anchors. In the video they have 23 of them. I placed 5 beacons in the same network but the app only accepted 4 of them. Maybe there is a hidden feature somewhere I did not find yet. However I do thing the technology should be able to support flawless automapping so I think it is just a software thing which needs to be resolved. what does that mean when you say that the BLE beacons don’t work? from what i understood this estimote product is a beacon with uwb — can the uwb part (decawave chip?) detect location of a phone that has a linked app using 3g/4g? this video from estimote is how i imagine it to work: https://www.youtube.com/watch?v=ULBN4yv9-EY : does this work with bluetooth or cellular network? What I think does not work in BLE beacons is that the ranging based on RSSI (Received Signal Strength Indication / signal strength) is not that successful. The value fluctuates a lot and you need to do some filtering and averaging to get a proper readout. This means to me that you cannot get a accurate location fix based on the strength of the signal, especially when you are a moderate speed moving object (i.e. 5kph/3mph). When you also look at the RSSI and look at it in terms of distance to beacon you get the same readout for different distances. This can be caused by reflections and the lack of having a Line of Sight (LoS). The video you refer to (https://www.youtube.com/watch?v=ULBN4yv9-EY) does in fact describe how it (should) work. I tried it as well and was only able to pair up 4 beacons, not the variable amount which was shown in the video. Also it takes some time to get the map because the app keeps crashing all the time when you want to do an automap. I hope (and expect) that Estimote will fix this soon. I did not report it to them yet (maybe I should). It can also be it is my fault and I did something stupid (again). When using automap (several times) the batteries of the beacons (acting as anchors) are drained ridiculously fast. Within hours they will be exhausted. This lead me to reverse engineer the device and see how this could be improved. I want to give power to the device from external source. I do not know the voltage requirements, but since I have the schematics and the most likely components used I can find out the minimum and maximum voltages of all affected components. Can I hook it up to a 5v USB charger or will it fizz with that voltage. I will soon find out. I have already seen the datasheets of the DW1000 and DW1001. This made me decide to buy 12 in the first place. Location determined on ToF is to my opinion a good option for indoor location next to VisibleLightCommunication (which does not need UWB hardware). UWB is used to do AutoMapping of the room. That makes it easy to deploy beacons. It does not explicitly mean that you will be using UWB to do location determination. If your phone does not have a UWB (which is most definitively will not have) you cannot use this technology to locate a phone. For that you will have to fall-back to the good old BLE location stuff (which I do not like). What you can do is to also have an extra device with you (which you have to carry with you) which has UWB onboard (like another Estimote UWB beacon). That one you can pair to your phone and you have a 30cm accurate location fix. Maybe is is possible to make a BLE mesh where you let the UWB tag interact with the surrounding UWB Anchors which in turn communicate with a location server. More on tags, anchors and location servers in a next article soon. Hi Marco! Thank you! Looking forward to your next article!! probably protected from a teardown but please tell me what you think of the specs!